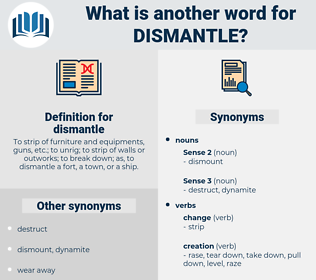 What is another word for dismantle? To strip of furniture and equipments, guns, etc. ; to unrig; to strip of walls or outworks; to break down; as, to dismantle a fort, a town, or a ship. disband, lay, remove, removes, abolish, Abolishing, disintegrate, destroy, destroys, disarm, eradicate, disable, liquidate, scrap, delete, deletes, dispel, unravel, defuse, uproot, lift, discontinue, break, repeal, dismount, evacuate, disperse, dispose, suppress, demobilize, cancel, cancelled, terminate, rescind, overturn, banish, topple, dismiss, abandon, disappear, overthrow, undo, withdraw, abrogate, resolve, resolving, clobber, solve, revoke, neutralize, reduce, demonstrate, erase, stop, tear, cease, smash, undermine, relinquish, annihilate, reverse, rid, extinguish, waive. 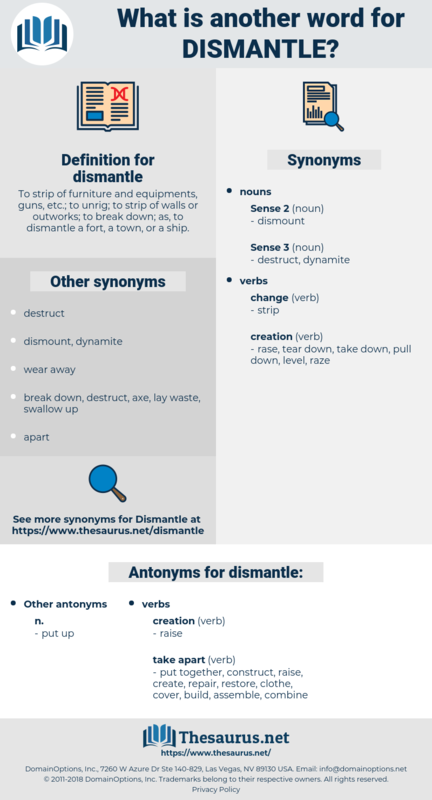 decommission, disassemble, demolish, eliminate, Eliminating, dissolve, disrupt, crush, abolition. construct, cover, repair, assemble, create, clothe, restore, put together. erect, unite, set up, combine, build, pitch. But the mill was to be repaired first, and then, when it became absolutely necessary to dismantle the house, they were to endeavour to make shift, and live in the big room of the mill itself, till their furniture should be put back again. take, take away, withdraw, remove.